For the money, you’d be hard pressed to find a similarly performing rifled slug. From a performance perspective certainly, but also from a manufacturing quality perspective. This is a truly premium maker of ammunition that offers some of the best ammunition consistency in the business. The Sellier & Bellot brand name has been providing consumers with a top notch product for more than 190 years. The rifled slug in the 1 ounce configuration that is featured here is no exception to that. It starts with the massive 1 ounce rifled slug that is made of a massive piece of lead. The rifled, heavyweight projectile offers superior performance for those looking to hunt big game at short range with their shotgun. The flight trajectory is flat and the huge amount of energy delivered is a major perk to the slug. The clear hull that surrounds the rifled slug gives the hunter instant tactile reinforcement of the ammunition hey are loading and the accuracy of the round is unparalleled at the price point. One can reasonably expect 2MOA out of most guns out to the 100 yard range. This is exceptional considering the massive diameter of the projectile and the fact that this will cycle flawlessly in any shotgun out there in 12 gauge 2 ¾” chambering. 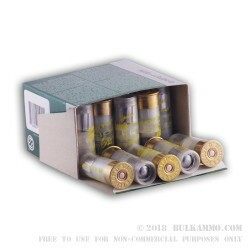 Great ammo at a great price. Accurate out of my Saiga 12 with HK sites. Q: whats so special about this slug? 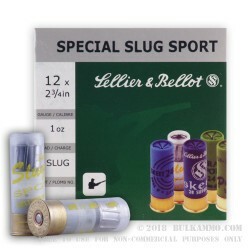 A: Sellier & Bellot uses the term "special slug" in regards to their 12 ga slug to denote that it is specially designed for sporting purposes. Basically, this is a standard lead slug and the term "special" has been applied to denote its purpose.